Spring Break: Continental Shelf – Day 11 – Crossing the Border – Ya Like Dags? Two posts in one day! Enjoy while it lasts, I may never manage this again. Today the Bigelow made it past Cape Hatteras to do a little southern sampling. I’d hoped to get some spiny dogfish diet data from south of the Cape but it appears that at least this far offshore the spiny dogfish switch is set to “off.” This is very interesting given that my own major professor and several of his students have done quite a bit of work on spiny dogfish south of Cape Hatteras. At least as far as this cruise is concerned, the spinies have been replaced with smooth dogfish. Something lurks beneath this pile of croaker, spot, and smooth dogfish. The Bigelow is equipped with a large animal sling just for situations like this. By the way, that’s an adult female sand tiger shark. 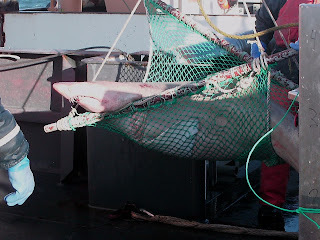 Measurements were taken and the shark was tagged. You can tell by the skin tone that it’s still winter conditions in the water. Yes, sharks do tan. After being measured and tagged, the 2.3 meter (over 6 feet!) shark was lowered back into the water. Badass stuff, even if the spiny dogfish action has dropped precipitously. Right now I’m taking the opportunity to relax (and catch up on some school-related work) in preparation for another marathon sampling session. We’ll be looping back up through the offshore stations off of North Carolina, where I expect to pick up dogfish from some different demographics. Did you hug the Sand Tiger? Chuck I just found your passport have fun getting back across the border. Would you say that your tip is "just like" or "almost like" the Beach Boys song "Sloop John B"? The Sloop John B didn't have awesome sharks. That said, I definitely thought of that song when I was seasick at the beginning of the trip.